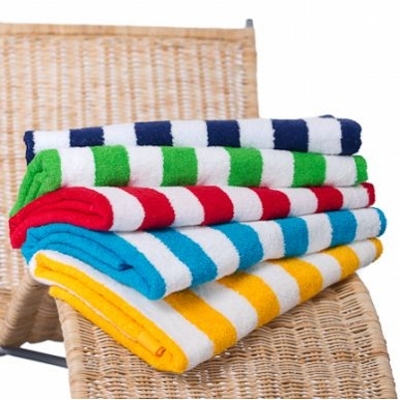 Large Striped Terry Beach towel in 5 bright colour ways., 100x175cm, 430gm2 Perfect for Print, Embroidery or Photo Materials: 100% cotton terry. Item Size: 100 x 175cm. Packaging: single poly bag. Colours: Aqua | Yellow | Red | Navy | green. Decoration Options Available: Print | Photo | Embroidery. Decoration Areas: 70 x 90cm. Fibre reactive printed large beach towel with edge to edge printing up to 10 colours. Made in China. 12 week lead times approx. Please call customer service for assistance. Materials: 100% cotton velour. Item Size: 86 x 160cm. Packaging: single poly bag. Colours: Up to 8 colours. Large Terry Jacquard Beach towel in 2 bright colour ways. 86x180cm, 530gm2. Perfect for Embroidery or Photo Materials: 100% cotton terry. Item Size: 86 x180cm. Packaging: single poly bag. Colours: Red/Black/White | Red/White/Blue | Royal/Aqua/Navy. Decoration Options Available: Embroidery | Photo. Decoration Areas: 860mm W x 240mm H.
Signature Velour Sports towel to suit many different decoration options. 40 x 100cm, 380gm2. Print with TONE ON TONE, IVORY TOUCH, BLACK PRINT or embroider or add Photo decoration. Refer to customer service for additional colour print information Materials: 100% cotton velour. Item Size: 40 x 100cm. Packaging: Single poly bag. Colours: Black | Navy | White. Decoration Options Available: Screen Print | Embroidery | Photo. Decoration Areas: 38 x 90 cm. 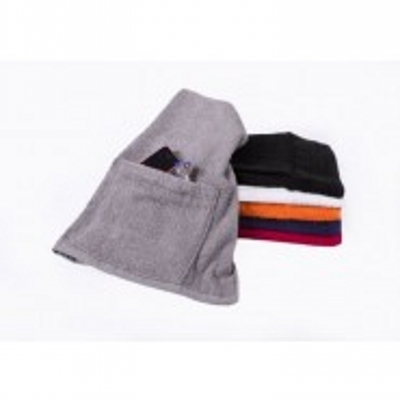 Elite Terry Sports Towel with Pocket and zip. 450 gm2. Add embroidery or Photo Materials: 100% cotton terry. Item Size: 40 x 100cm. Packaging: single poly bag. Colours: red | black | Steel Grey | Navy | orange | white. Decoration Options Available: Print | Photo | Embroidery. Hand Towel. 580gsm - 100% Cotton yarn dyed towel with dobby border. With terry towel on both sides. Colours: Black, Navy, White. Sizes: 40cm x. 60cm. Striped Beach Towel. 450gsm - 100% Cotton, Terry Towelling on Both Sides. Cotton border on all sides. White and contrasting colour stripes run full length of the towel. Colours: Navy/White, Red/White, Gold/White. Sizes: 162.5cm (L). 87.5cm (W). Fitness Towel. 390gsm - 100% Cotton Wide print/embroidery area. (Max. 6cm in height). Fits most standard weight benches. Colours: Navy, White. Sizes: 110cm x. 30cm.